Looking at the ongoing housing movement in London, the occupiers at the Sweets Way estate have started work on their “people’s regeneration show home”, aiming to make a condemned and derelict house livable again. You can read more about their project here. Further ahead, the Focus E15 Mothers are calling for a march against evictions to mark their two-year anniversary in September, as well as being part of an East London day of action this Saturday. Also in East London, there’s East London Rising, a week of free events at the London Action Resource Centre in early August, that’ll include a day focused on anti-eviction and housing campaigns, as well as a day on claimants’ and workers rights and more. In workplace news, things have been incredibly busy in the fight against blacklisting and the construction sector more broadly. To just pick a few of the biggest stories, as well as the spectacular immediate victory won by rank-and-file direct action at Canary Wharf earlier this week, last week was supposed to see the Blacklist Support Group secretary Dave Smith go on trial for charges related to an earlier protest against the sacking of a worker on the Crossrail project, but at the last minute it was put back to early January. Apart from anything else, this story shows why every worker in the country should be green with envy at the uniquely relaxed working conditions enjoyed by the incompetents at the Clown Prosecution Service – can you imagine turning up to work, explaining that you’d not prepared properly to meet an important deadline, and being told “oh, it’s fine, just come back some time next year and do your best to have it sorted out by then”? 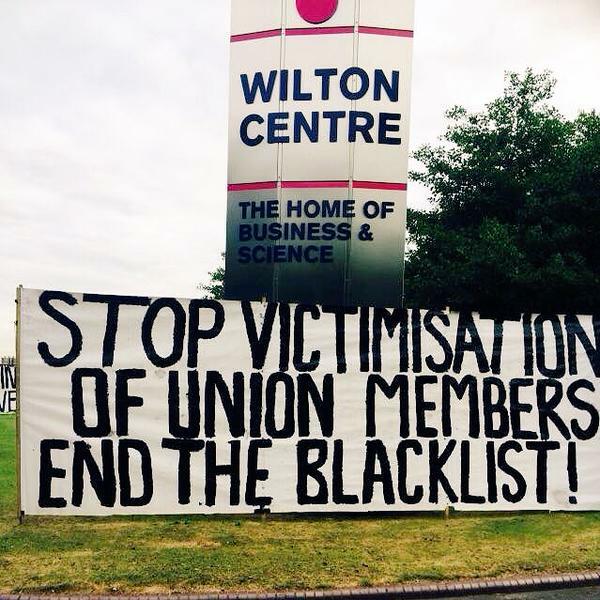 Staying with the blacklist theme, this week also sees the start of the Pitchford Inquiry into undercover policing, and to mark the occasion Undercover Info have published a long list of blacklisters who’ve been named after a court order. They share information on us, let’s share information on them. The busy times in the construction industry certainly haven’t been all confined to courtrooms and building sites in London either. Up in Teesside, construction workers have been continuing their campaign against the undercutting of wages which has been running for sixteen weeks now, and has seen cops with guns turning up on picket lines in Redcar. Reel News have been covering the dispute, and for more information or to show your solidarity, check out Teesside Construction Activists and the #paytherate hashtag. In other workplace disputes, the United Voices of the World union is still fighting for the reinstatement of the last two sacked workers at Sotheby’s, as well as for the original demand of sick pay and fair treatment, with their next protest scheduled for Friday 31st at 5.45. Bike couriers in London are also continuing a campaign of flashmob protests at clients of courier firm Citylink as part of their fight for the London Living Wage. And throughout August, September and into October, Dave Pike, national secretary of the IWW, will be doing a national speaking tour to introduce this fighting union and its activities. Looking at the fight against racism and nationalism, reports are circulating of sabotage against an immigration raid in Shadwell, while the next big antifascist mobilisation coming up is against the White Man March in Liverpool on August 15th, with transport now running from Sheffield, Manchester, and the East and West Midlands, as well as an open mobilising meeting in Leeds in early August. And finally, two pieces of cheering international news: comrades from down under report on how Sydney Solidarity Network won a worker money that her employer was refusing to pay up, and the US-based Workers Solidarity Alliance have a round-up of recent grassroots victories in the class war over there, including another success for the long-running and incredibly effective Seattle Solidarity Network. Over there, as over here, solidarity and direct action get the goods. This entry was posted in Housing, Protests, Racism, Stuff that I think is pretty awesome, Unions, Work and tagged Blacklist Support Group, Industrial Workers of the World, United Voices of the World. Bookmark the permalink.